Press Command+Shift+P (Mac) or Control+Shift+P (Windows, Linux) to open the Command Menu. Make sure that your cursor's focus is on the DevTools window, not your browser viewport. Go to options (Windows: three vertical dots in the top right) -> Settings, or hit F1. If Developer Tools aren't open then press F12 key on keyboard to show the Developer Tools. In Opera browser you have to use key combination Ctrl + Shift + i on keyboard to open it. To show the settings just press F1 key on keyboard. The Developer Tools window must be focused when you are doing it. Or if you want to open the settings with the mouse then you have to click on ⋮ button in the top right corner of the Developer Tools, then click Settings in the menu. Just click on this checkbox and push esc key on keyboard for hide the settings. If you want to enable it then you have to do the same way again. If Developer Tools aren't open then open it like in the first way is described. Press the key combination Ctrl + Shift + P (for Windows or Linux) or Cmd (⌘) + Shift + P (for Mac) to open the Command Menu. Be sure that the focus is on the DevTools window. For some reason it is possible that it does not work. I this case open a new empty site in "Incognito Mode" and do all this there. Press F8 for temporarily freezing / unfreezing JS (with DevTools open). Is it possible to force a copy of a protected Google doc? 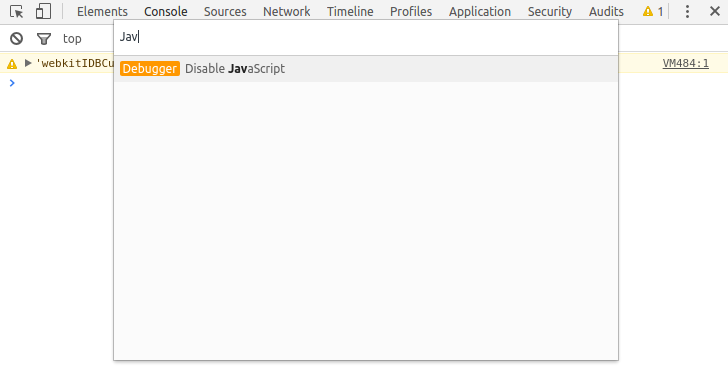 In Google Chrome Developer Tools, the toolbar icons disappeared. What gives?